This easy to make recipe results in a crisp crust that’s surrounded by a moist soft center. It’s perfect with a hearty bowl of winter stew or lightly toasted served alongside breakfast. I’m a huge fan of fresh sourdough boules, Italian round loaves and artisan bread creations. It’s hard for me to walk by a bakery when I can smell fresh bread baking. And who doesn’t love a freshly cut slice of artisan bread. I could eat the whole thing! But at $3-4 a loaf, there has to be an easier way to enjoy this all the time. A quick Google search turned up plenty of ideas. I decided to put my cast-iron Dutch oven to work. I wanted a recipe that wouldn’t take all day or all night. A few hours is all I have. I also wanted something that was easy to make with limited ingredients that did not require rolling the dough and waiting for it to rise. And I wanted something that tasted like what I get when I buy bakery fresh bread. Bingo! It took a few tries for me to get this recipe just right. The end result is delicious. Use a thermometer to measure the temperature of your water. Adjust the rack in your oven to the center. You don’t want to burn the bottom of the loaf. Make sure your Dutch oven has an oven-safe handle and keep the potholders nearby. 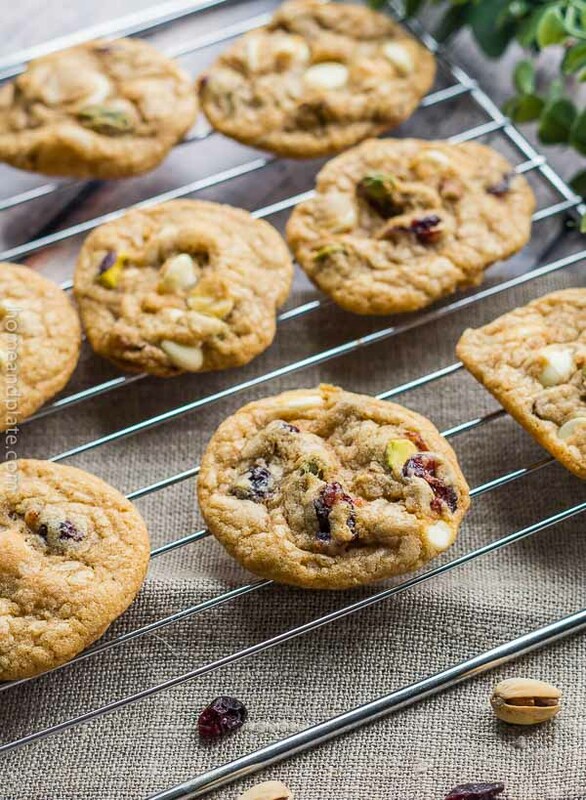 Use parchment paper during the baking process. Make sure to preheat your oven as well as your Dutch oven before baking your bread. Use bread flour instead of all purpose. It results in a heavier and more dense loaf. Mix your dry ingredients well. 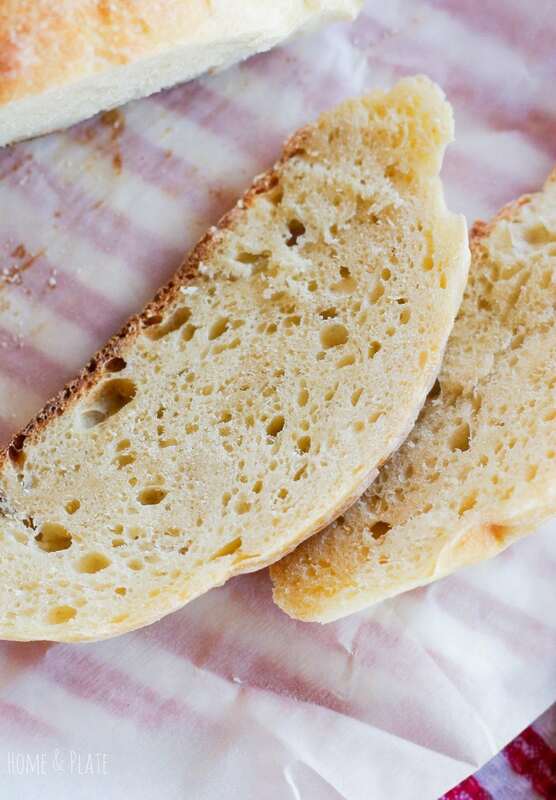 Remove your bread from the Dutch oven once it’s finished cooking so it doesn’t keep baking and burn the bottom of your loaf. The flavor of this bread is concentrated in the crust. It has a wonderful salty sweetness that is absolutely delicious. The sprinkle of kosher salt before baking is key. 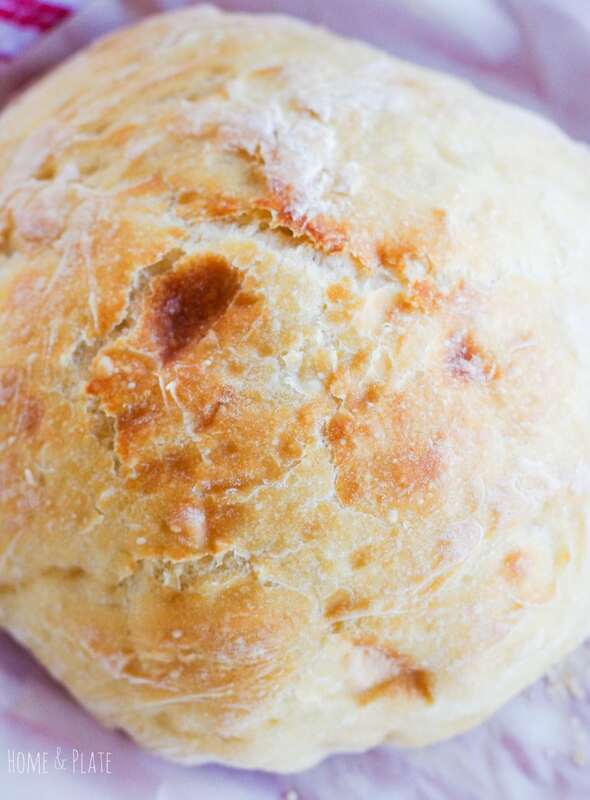 You may need to make more than one bread boule it’s so good! I promise it will get snatched up the minute you slice into it. 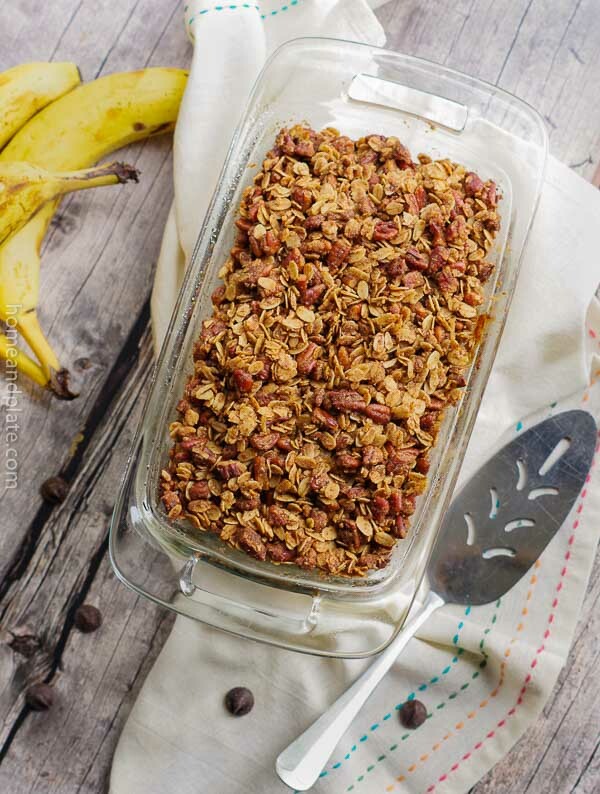 This recipe is best eaten the day it is baked. If you have leftovers be sure to freeze it or store it in a zip lock bag inside your fridge and reheat any leftovers in a 325°F oven to warm up. Now that I’ve mastered no knead Dutch oven crusty bread I’m ready to tackle variations. In a large bowl stir together the yeast, bread flour and salt. Fill a measuring glass with 1 1/2 cups of hot tap water. Use a thermometer to check that the water is warmed up to 125 - 130°F. Microwave the water at 20 seconds intervals if necessary. The temperature of the water must be between that temperature range. Pour in the warm water and stir to incorporate using your hands after a while if necessary. Cover the bowl with a piece of saran wrap or a kitchen towel and allow it to sit on your countertop for 4 hours. Arrange your baking rack so it is in the center of the oven. Preheat your oven to 450°F and place your empty Dutch oven inside to allow it to warm up while preheating. After preheating, lower the temperature to 425°F to bake. Place a piece of parchment paper on your countertop and sprinkle 1 tablespoon of flour on the paper. Transfer the puffy dough to the flour coated parchment paper, sprinkle the top of the dough ball with a bit of flour and fold it several times using a scraper and several more times to create a ball using your hands. Pick up the parchment paper by its sides containing the dough ball and place the paper into the preheated Dutch oven. Sprinkle kosher salt on top of the dough and cover with the lid. Next, place the Dutch oven inside the stove and bake for 30 minutes. After 30 minutes, remove the lid and bake for an additional 5 to 15 minutes watching closely to make sure the top of the bread boule does not burn. Remove the Dutch oven to the stove top, pull the parchment paper containing the bread out immediately and allow the boule to cool. Once cooled slice and serve. 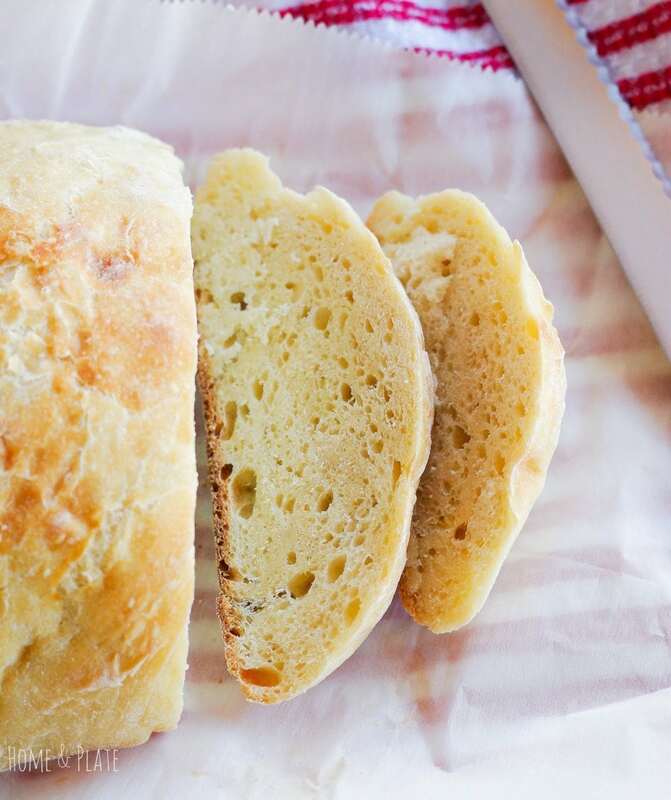 Your bread looks particularly yummy on this cold winter day. I’ve never baked a loaf in my dutch oven. This will be interesting! Thanks so much. It’s perfect with a bowl of hot soup especially during these chilly days of winter. 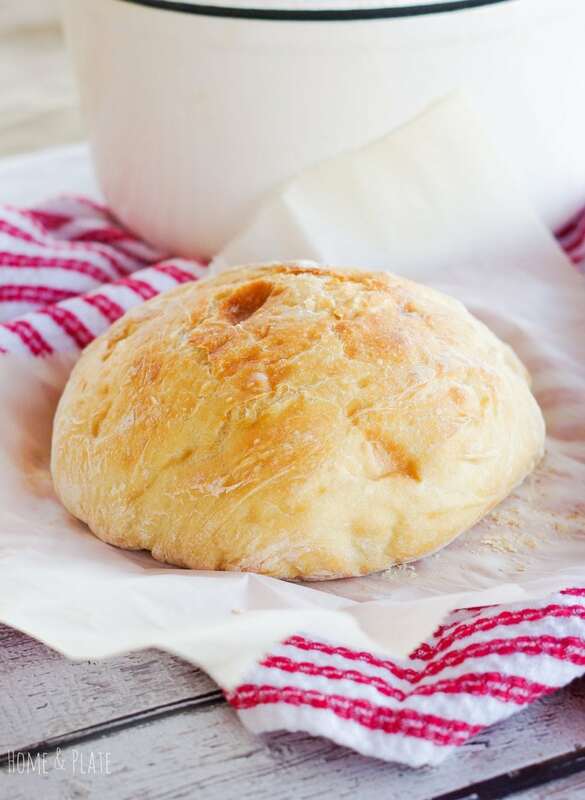 I’ve never made bread in a dutch oven before, but I love this recipe — it sounds straightforward and the end result is gorgeous! Well done! 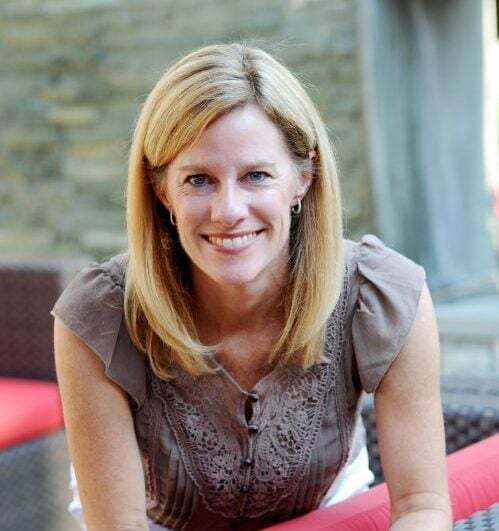 Thanks so much Lisa. If you have the time it results in a delicious loaf. 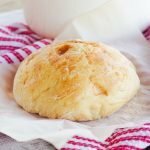 I love the no-knead method – low effort and great reward! Your loaf looks great. Thanks Heather. Such an easy way to make bread. Yum! I just got a Dutch oven around the holidays. I will definitely try this out. I’m a huge lover of carbs (gift and curse). I love all bread. If you love bread then this is the recipe for you. Hope you like it Brandi. A dutch oven has been on my wish list forever! This recipe just convinced me that I HAVE to buy one. This bread looks drool-worthy! I love "crusty" bread like this. I cannot wait to try this! 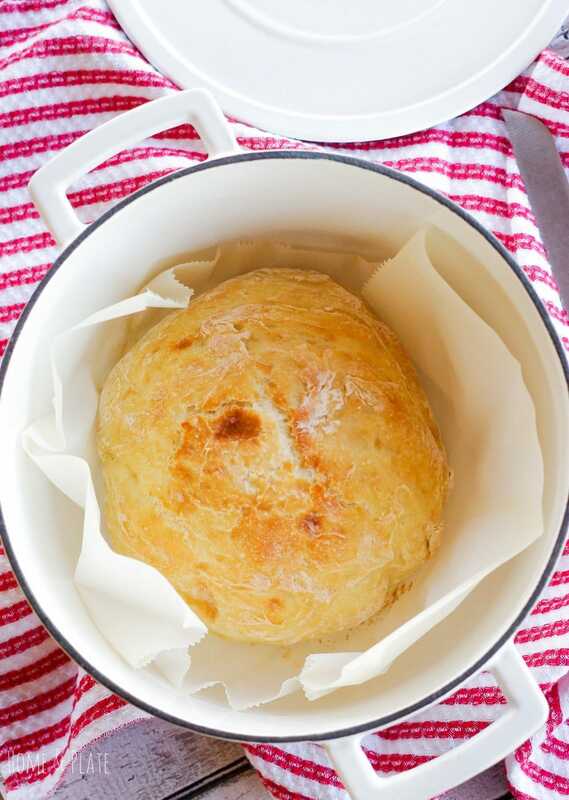 Homemade bread is my favorite and this gives me a reason to break out my dutch oven!